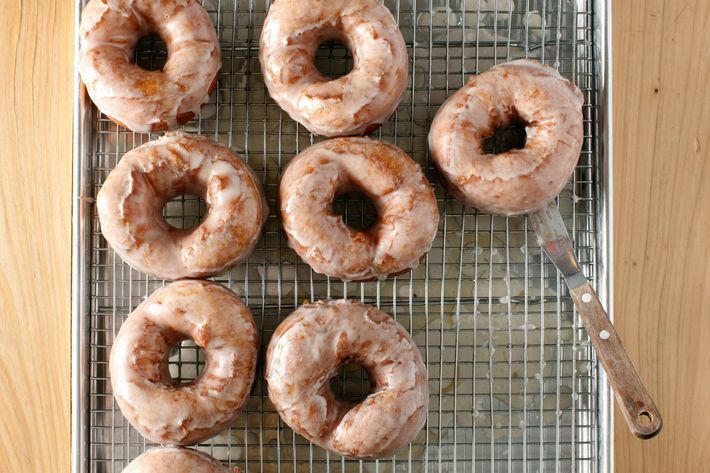 Nothing against the Garden State, but it’s not every day that a destination-worthy, world-class doughnut shop opens out in Central New Jersey. 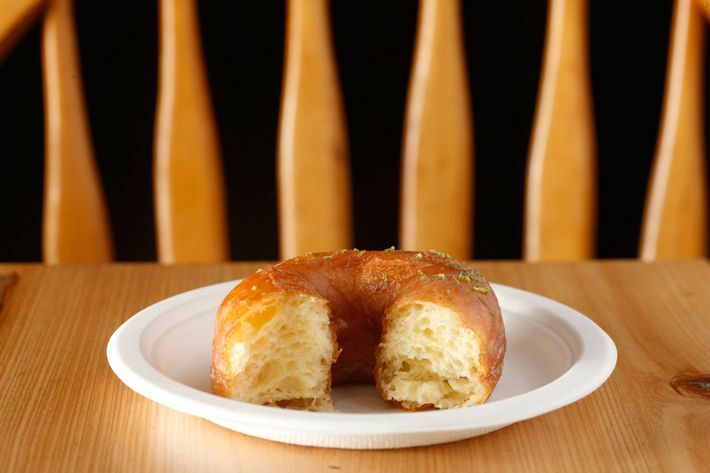 But then, Curiosity Doughnuts owners Aki Kamozawa and Alexander Talbot are not ordinary fry cooks, either. 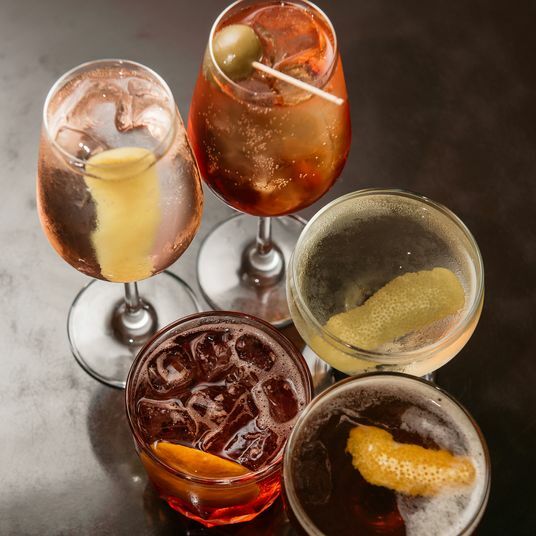 They’re the trained chefs, consultants, and writers behind the inventive and inquisitive site Ideas in Food, as well as three similarly minded cookbooks, including Maximum Flavor. 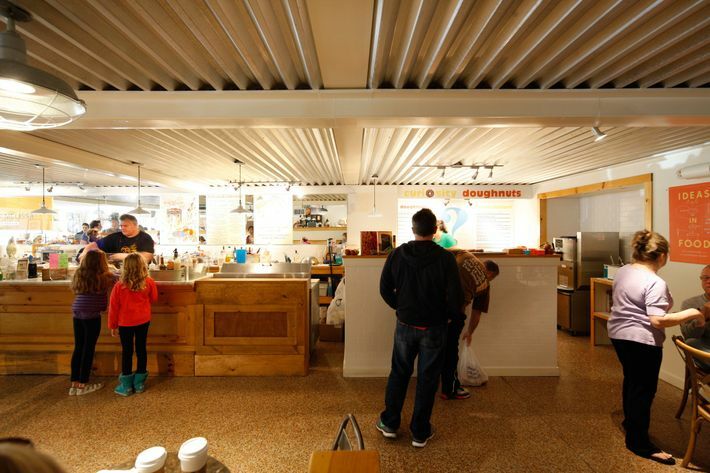 On October 2, they opened Curiosity Doughnuts in the weekends-only Stockton Market in Stockton, New Jersey, certainly an exciting development for food geeks and doughnut-lovers alike. Funnily, though, to many of their customers, there’s nothing particularly noticeable about them. 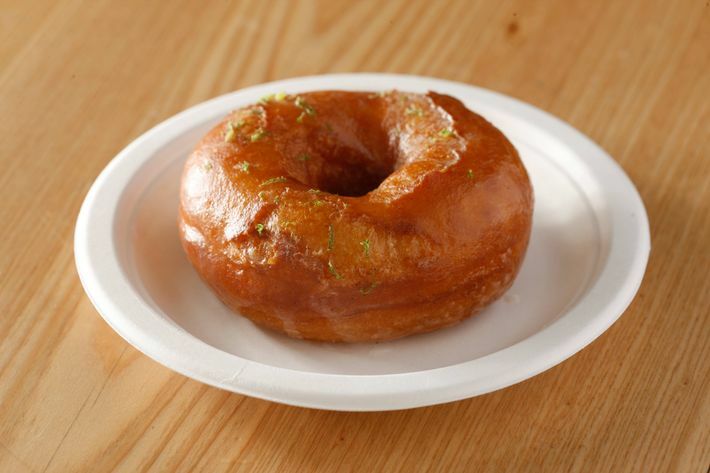 “It’s small twists, but it’s not like today we’re going to add a kimchee doughnut,” he explains. “Where can the smallest change make the biggest difference? 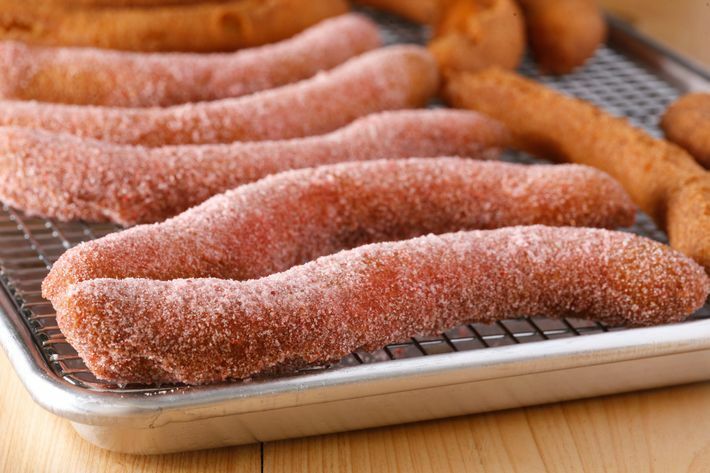 It’s choice ingredients, and finding the right time to use them.” So expect flavors that you grew up with, with slight tweaks: fragrant cardamom with the cinnamon, and freeze-dried strawberries in the strawberry glaze. 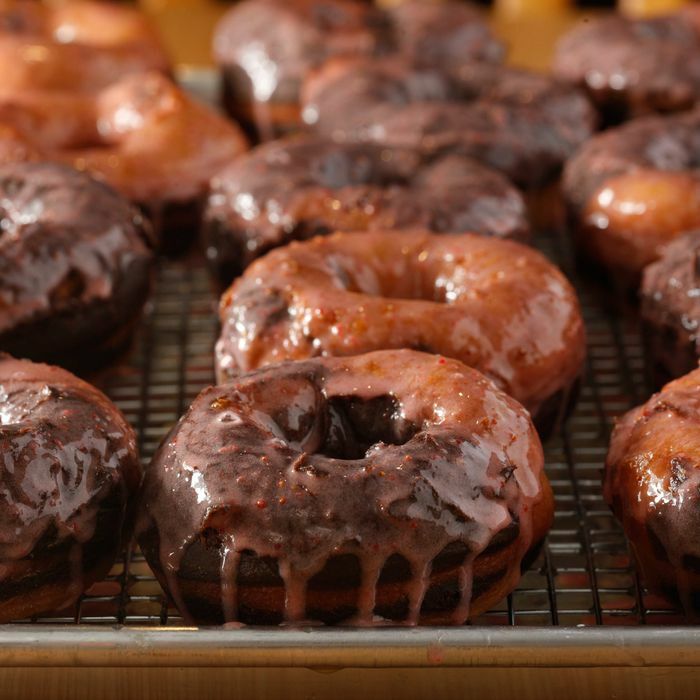 Now, in anticipation of your inevitable road trip to Stockton (it’s a 90 minute drive from Manhattan, an hour from Philadelphia), take a look at all the doughnuts, and then some, that Curiosity Doughnuts was selling this past weekend. The first innovation is something the duo calls marbled yeast doughnuts, which Talbot is pretty positive no one else has done before. 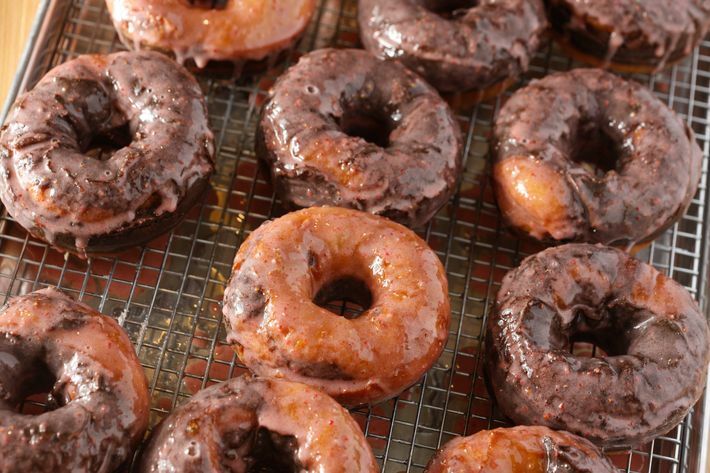 Named for its likeness to marbled rye, they’re made with the repurposed leftover scraps of other doughnuts. 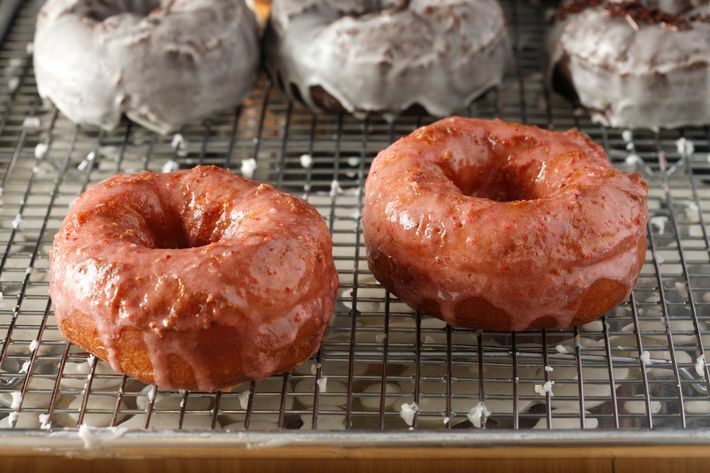 One is made with a vanilla glaze (above), another (below) with a strawberry glaze. 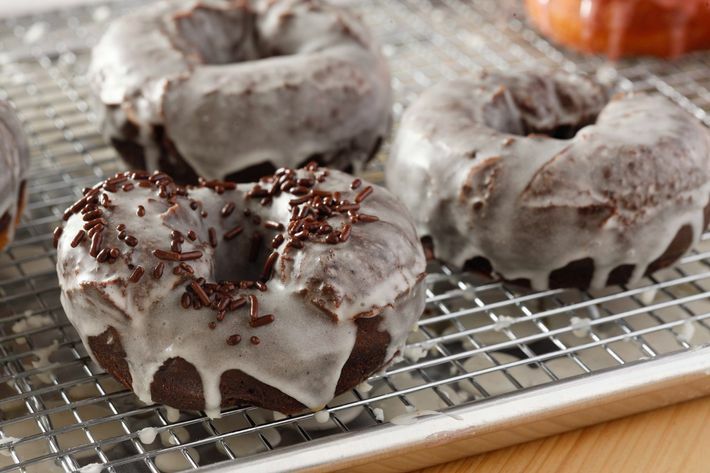 The chocolate doughnuts, as you might expect, are some of the darkest and richest around. 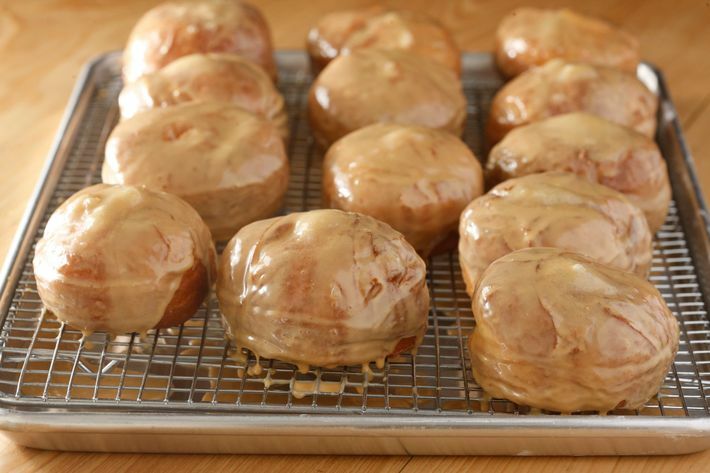 The apple-pie doughnut, seen below, has a butterscotch glaze and is stuffed with homemade apple sauce. You want to eat this doughnut. 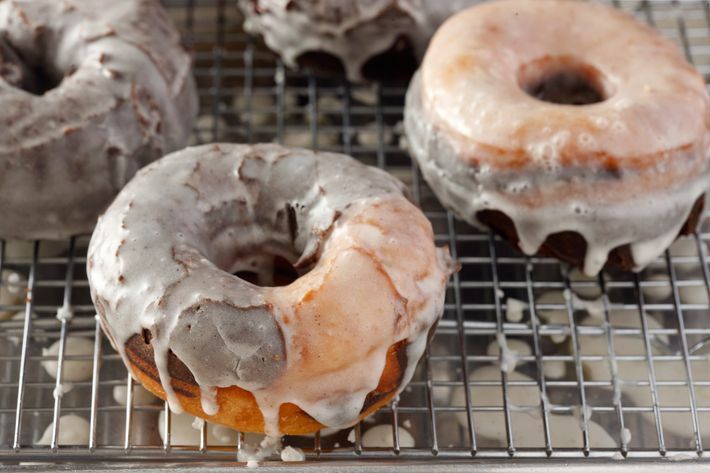 Even the simple yeast doughnuts with vanilla glaze are just about perfect. 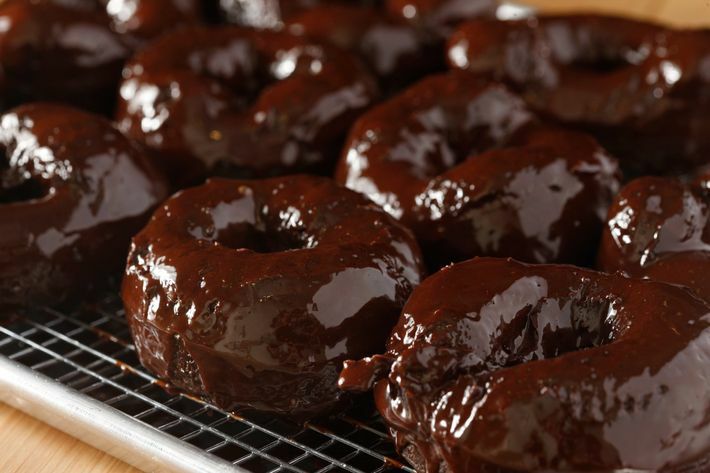 Most chocolate doughnuts are cake doughnuts, but Talbot and Kamozawa opted to go for yeast to make theirs. The sprinkles are free because they’re decent people. It’s not all vanilla and strawberry. 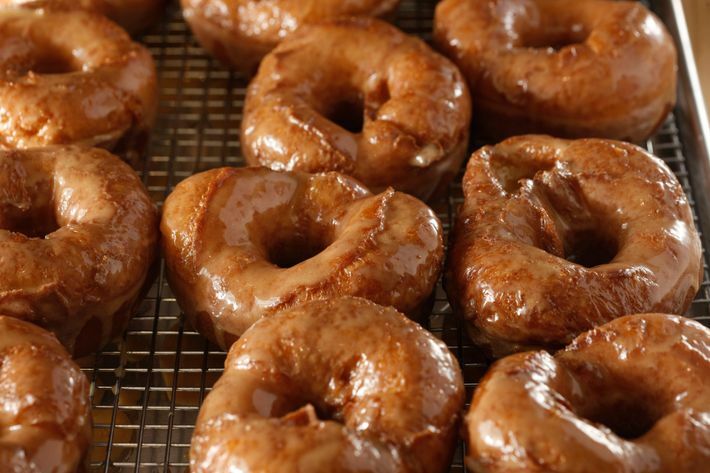 The beauties below have a butterscotch glaze. 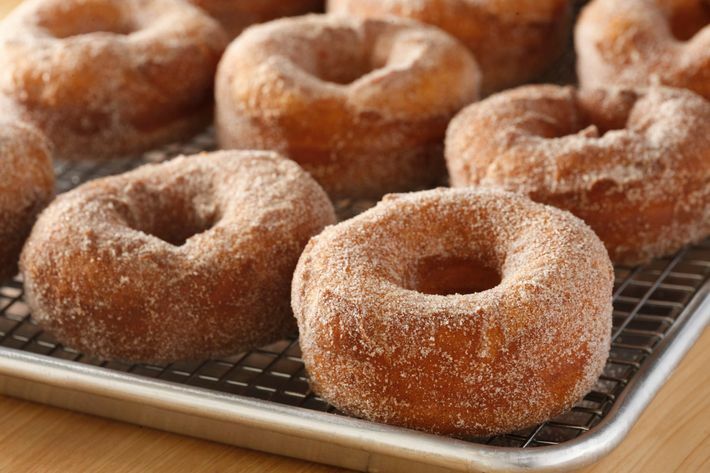 “When I bring this doughnut warm from the kitchen to the front, I am the pied piper of doughnuts. People follow me through the market,” Talbot says. Talbot, meanwhile, is obsessed with buttermilk, which they’ve used for this glaze. The freshly grated lime zest helps boost the tang even further. 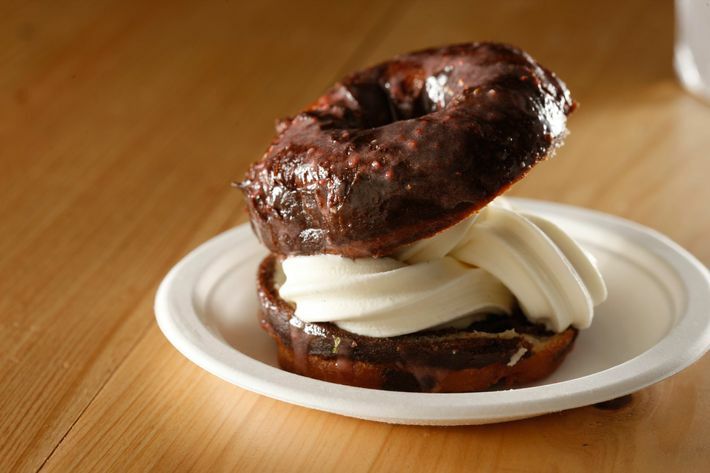 This is the doughnut ice-cream sandwich ($4.50) you have been waiting for. Of course, you get to choose which doughnut you’d like to have with your custard. 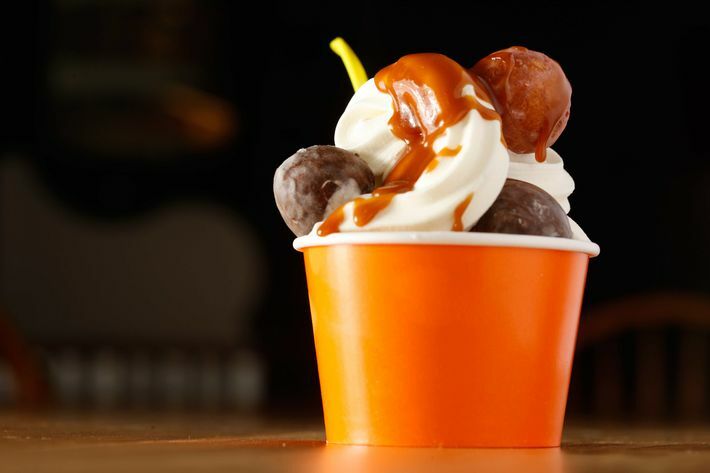 The Freeze Brain ($6.50) is the marriage of the two obsessions that drive Curiosity Doughnuts: a frozen custard sundae with your choice of four toppings (butterscotch, “ciderscotch,” chocolate caramel, and coffee caramel) and six doughnut holes. 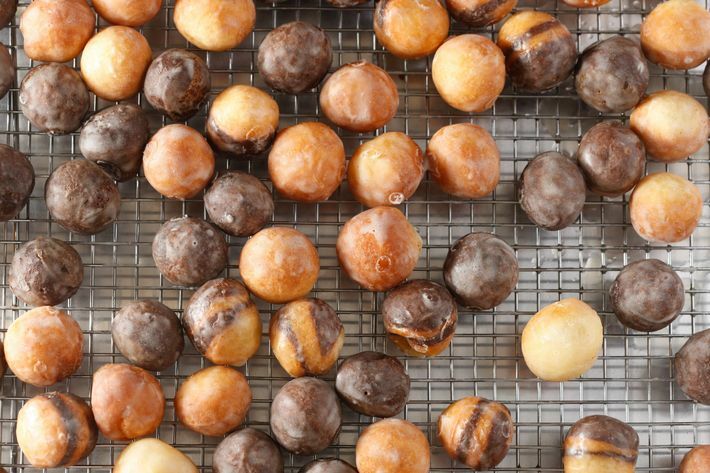 Oh, yes, speaking of doughnut holes, these are the shop’s chocolate, marbled, and glazed varieties. It’s $3 for six holes. 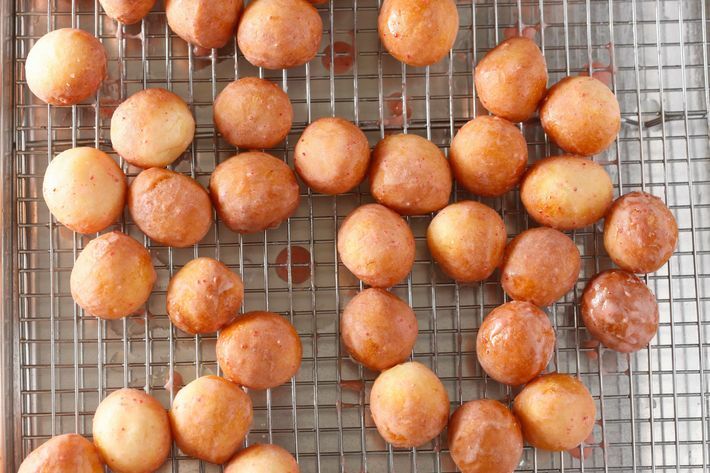 And here are the plain doughnut holes with strawberry glaze. 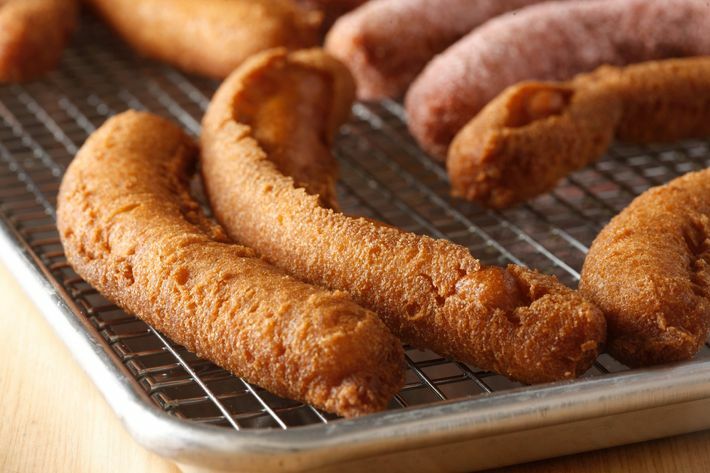 There are more shapes, too: The piped-drop doughnuts (all $2.50) are a nontraditional cylindrical shape, a consequence of a doughnut robot not working out. This one is made with lemon oil and citric acid. 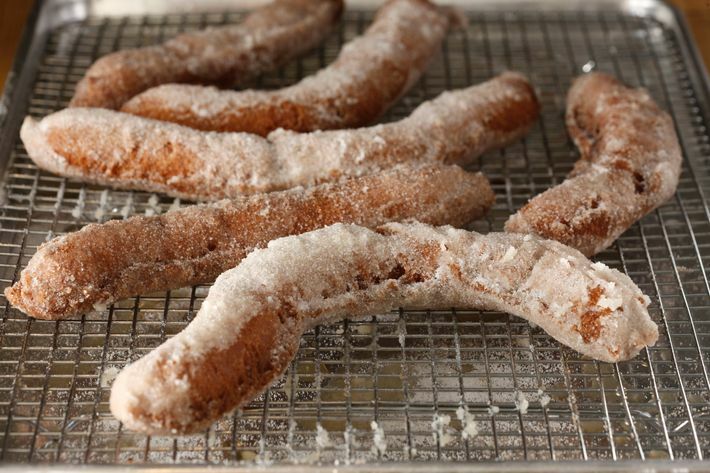 This is what you want to eat with your coffee.